We get the contents for you. Use your time to make your business grow. The Customized Newsletter on EU information provided by Euroalert.net, is an information service which allows you to receive in your email new contents about the European Union that are relevant for your activity. 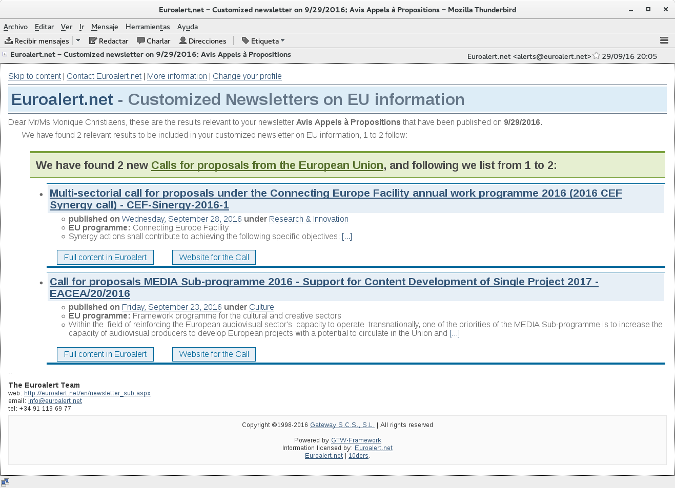 Thanks to this customized newsletter you will receive in your mailbox up to date information about new funding opportunities for your projects through EU calls for proposals, as well as the legal provisions published in the Official Journal of the EU. By setting a profile with the contents and criteria which are relevant to your activity, you will get the most accurate results and receive only relevant information. For a small subscription fee, it is possible to display Euroalert.net contents, continually updated, on your organisation's website. Using the programming language that you choose, it is possible to display, filter and sort the contents without having to store them on your own database. This subscription allows you to remove any supplier branding and to deploy through private non-pay websites (e.g. corporate Intranet). The service does not allow for the storage and redistribution of contents for profit.